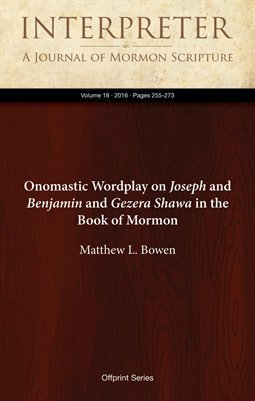 The Book of Mormon contains several quotations from the Hebrew Bible that have been juxtaposed on the basis of shared words or phrases, this for the purpose of interpreting the cited scriptural passages in light of one another. This exegetical technique — one that Jesus himself used — came to be known in later rabbinic times as Gezera Shawa (“equal statute”). In several additional instances, the use of Gezera Shawa converges with onomastic wordplay. Nephi uses a Gezera Shawa involving Isaiah 11:11 and Isaiah 29:14 twice on the basis of the yāsap verb‑forms yôsîp/yôsīp (2 Nephi 25:17 and quoting the Lord in 2 Nephi 29:1) to create a stunning wordplay on the name “Joseph.” In another instance, King Benjamin uses Gezera Shawa involving Psalm 2:7, 2 Samuel 7:14, and Deuteronomy 14:1 (1–2) on the basis of the Hebrew noun bēn (“son”; plural bānîm, bānôt, “sons” and “daughters”) on which to build a rhetorical wordplay on his own name.